The Best Habit blogs from thousands of top Habit blogs in our index using search and social metrics. Data will be refreshed once a week. Facebook fans 1,261,131. Twitter followers 111,233. Facebook fans n/a. Twitter followers 192,628. San Francisco, CA About Blog Real stories of success in productivity, health and leadership. Build a habit around any goal. Hire an accountability coach to get daily support for building your potential. Facebook fans 9,452. Twitter followers 471,421. Facebook fans 143,191. Twitter followers 2,942. About Blog Build a Great Life - One Habit at a Time. Like many people, I’m keenly interested in self-improvement , self-publishing, habits, self-help, learning, productivity goal setting. Facebook fans 5,847. Twitter followers 17,519. San Francisco, CA About Blog Simple Habit is a 5-minute meditation app for busy people. Designed by top meditation teachers. Simple Habit is on a mission to empower humans to stress less, achieve more and live better. Facebook fans 9,928. Twitter followers 955. Annapolis, MD About Blog Dr. A is the best-selling author of "Dr. A's Habits of Health" and a leader in the battle against obesity. Learn more about Dr. A and explore his resources. Facebook fans 26,025. Twitter followers 3,269. Global About Blog Habyts is the family habit-building app that helps regulate screen time usage, motivate kids & build better family habits - without nagging. Their mission is to end screen time struggles, homework hassles and chore wars - while building good habits for life! Facebook fans 1,201. Twitter followers 284. Santa Monica, CA About Blog The Game That Changes Your Whole Life. To create lives of unbound possibility where health and fitness are limitless resources and the right of every human to design and share. Facebook fans 57,379. Twitter followers 4,294. San Francisco, CA About Blog R/Habits is a place to share news and discuss the formation, cessation, and alteration of habits in people. Facebook fans 1,158,557. Twitter followers 517,461. Irvine, CA About Blog The latest news, videos, and discussion topics on Habits. Facebook fans 3,401,548. Twitter followers 3,285,165. Linz, Austria, Europe About Blog Fitness, Nutrition & Health. We want every individual to live a more aware and active lifestyle with Runtastic, leading to a longer, happier life! Improved sleep, relaxation, recovery, mental toughness and balance as well as a proper diet. Everything to do with your well-being and a healthy lifestyle. Facebook fans 2,615,864. Twitter followers 102,375. San Francisco, CA About Blog Helping families make smart choices for kids in a 24/7 media and technology world. We review movies. Facebook fans 150,796. Twitter followers 92,134. Facebook fans 53,329. Twitter followers 87,146. About Blog Free Quality Guitar Lessons. I’ve been playing guitar for 30 years and professionally for the last 20 years. Nowadays I teach and practice guitar. I meditate, blog, read, run, spend loads of time with my family and friends and continue to simplify my life. Facebook fans 6,709. Twitter followers 3,594. Boston, MA About Blog Using scientifically proven and user-tested methods, Pavlok uses both Positive Reinforcement and Negative Reinforcement to help users form good habits. End any bad habit with our wearable device! Facebook fans 43,255. Twitter followers 4,991. About Blog Discover new ideas to mix into your morning routine. New routine every Wednesday! Facebook fans 6,149. Twitter followers 6,112. Belmont, CA About Blog Build healthy habits.Seeing healthy eating and exercise as a chore? Imagine actually enjoying doing the right things. Fitness Reloaded is the platform to changing your habits. Facebook fans 14,500. Twitter followers 2,161. Freehold, NJ About Blog Develop the Habits to Create Opportunity Luck, Achieve Consistent Success, and Build Wealth. Facebook fans n/a. Twitter followers 8,599. Amsterdam, The Netherlands About Blog Turning Success into a Habit. Let's Reach Success is a personal development blog. The content is focused on teaching you how to turn success into a habit and dreams into goals. Facebook fans 1,384. Twitter followers 17,078. About Blog I created a habits checklist to complete each day. It lists my top daily habits. Tackling them gives the day some structure, like when to pop out of bed and when to go for a run. Facebook fans n/a. Twitter followers 1,321. Facebook fans 7,281. Twitter followers 159. Los Angeles, CA About Blog Habitica is a game for improving your real-life habits! Habitica is a habit tracker app which treats your goals like a Role Playing Game (RPG) to help you stay motivated. Facebook fans 15,450. Twitter followers 9,609. San Francisco, CA About Blog Our free app helps you keep up with your medicine and healthy habits, so you can savor the moments that matter the most. Facebook fans n/a. Twitter followers 3,292. Facebook fans 5,450. Twitter followers 948. Auckland, New Zealand About Blog Our blog designed to help you lose weight and live a healthier happier life forever. I understand how difficult it is to resist temptation, start something new and change old habits. That’s why I aim to teach new habits, recipes and exercises at a steady pace. We're also a fun and supportive community dedicated to helping you achieve your health goals one step at a time. Facebook fans 55,303. Twitter followers n/a. About Blog Productivity Coach – Helping you achieve more in one month than most people do in a year. Your go to resource for kicking limiting beliefs and old habits to curb. Facebook fans 3,365. Twitter followers 317. Copenhagen, Denmark About Blog Tips & tricks for better personal and team productivity.SquidHub is a collaboration app for people who want clarity, simplicity, a bit of fun and a great way of working together. Facebook fans 314. Twitter followers 54. Facebook fans 5,913. Twitter followers 2,168. About Blog Let’s get on with changing your golf habits. New York, NY About Blog Latest articles on healthy habits. Oakland, CA About Blog Sean Flanagan, a personal trainer and nutrition coach in Oakland, CA. Habit-based fat loss coach, advocate for the lifting of heavy things, and connoisseur of tacos and thrash metal. Facebook fans 50,671. Twitter followers 140. About Blog Articles on saving habit of a middle class valued couple for early Retirement in India. Massachusetts, USA About Blog My SchoolHabits.com is to teach students key school habits and study skills that will stick with them as they move forward in their education. My videos and articles cover critical school topics, from time-management to procrastination, study tips to productivity. Facebook fans 282. Twitter followers 152. About Blog Healthy Habits Happy Moms is a community of women learning to balance food, fitness and motherhood. They're passionate about helping you lose weight, get healthy, and love your body....on YOUR terms. Facebook fans 38,296. Twitter followers 64. Yakima, WA About Blog Simple Habits for Success. Along my journey, I’ve developed many simple habits that have helped me to become more creative and more productive. And guess what? Anybody has the ability to create habits that will lead to a more successful life. It’s my hope that I can help you reach your goals. Facebook fans 2,210. Twitter followers 256. Los Angeles, CA About Blog I am a NASM Certified personal trainer with a passion for healthy living and wellness. My goal is to inspire others into making positive changes in every aspect of their life. Facebook fans 598. Twitter followers 226. Silicon Valley About Blog I’m a fitness & nutrition coach helping women over 40 get into the best shape of their lives. My training philosophy is that small progress leads to big results and the journey is meant to be enjoyed, so I offer programs that can be done at home and flexible nutrition plans that provide room for your favorite foods (in moderation). Facebook fans 28,810. Twitter followers 123. About Blog Welcome to the habit.space. Learn unusual strategies for losing weight, gaining muscle, learning, and all-around being crazy productive. Facebook fans 925. Twitter followers 1,194. Germany About Blog I travel around the world for both work and pleasure. I have a penchant for exploring ancient and modern places and the people, plants, and foods entangled in them. This website is a space where I share stories, advice, and the habits I maintain along the way. Facebook fans 653. Twitter followers 157. Facebook fans 1,317. Twitter followers n/a. About Blog Articles on nail bitting habit and its affect on the health. Huntsville, AL About Blog Real Healthy Habits--personalized weight loss coaching to lose weight and keep it off using a research, habit-based approach. No willpower or dieting required. Emphasis on fun, simplicity, and being realistic for women's fast-paced lives. Facebook fans 88. Twitter followers 235. Phoenix, AZ About Blog Teaching others to save smarter and creating habits to live a fit, healthy & financially independent lifestyle. Facebook fans 11. Twitter followers 223. About Blog She is passionate about supporting you master your mind and your emotions so that you can connect to your authentic self. Sharing powerful transformative tools that inspire the habits of health and happiness. Facebook fans 61. Twitter followers 39. About Blog Reading classics and hard books, and spouting rhubarb about them. London, England About Blog I believe that the thoughts we generate impact our life greatly. If we are able to change our thoughts, redirect them, catch our negative cycles of thinking, we can then change our life and our impact on the world. Additionally, we set a new habit of always being honest, truthful, clear , sincere and humble in a very gently assertive way. Boston, MA About Blog Andrew Merle writes about living well, including good habits for happiness, health, productivity, and success. Facebook fans n/a. Twitter followers 1,690. About Blog Our thoughts on habits, performance and the workplace. We believe that the greatest source of competitive advantage for a company is a set of pivotal habits that, if practiced consistently, make people healthier, happier, more secure and, ultimately, better at their jobs. Facebook fans 410. Twitter followers 161. Los Angeles, CA About Blog Wellness Coach. Begin. Build. Become. I’m a huge believer in developing habits that lead us to discover and bring forth our fullest human potential. Facebook fans 189. Twitter followers 534. South Coast, England About Blog Think, Plan & Act Productively.The Productive Writer specialises in Personal Productivity, Evernote, Time Management, Habit Building. Facebook fans 46. Twitter followers 472. Toronto, Canada About Blog Everyone deserves to live a healthy and happy life. Welcome to Healthy Habits - Hypnosis for Positive Change! Get in touch and change your life forever. Facebook fans 20,970. Twitter followers 1,060,683. About Blog Turn life's lemons into lemonade. Family Lemonade Stand is a perfect intersection between Emily’s passion for the helping profession and her appetite for habits and productivity! Functional coaching with a focus on building habits to transform health and productivity. England, United Kingdom About Blog Purity in Every Bite. We like celebrating good things in life with a happy body and soul in mind. It is a core of our business to share our lifestyle and habits with you. We can all live in peace and harmony with the abundance of good food! Facebook fans 295. Twitter followers 442. Gent About Blog Online management Habit coaching to improve your business and lifestyle. We are the Habit Company. Helping people, teams and organizations to develop new habits since 2006. Facebook fans 911. Twitter followers 1,466. Princeton New Jersey About Blog Change a habit, change the world. To reduce our community’s energy use and waste as well as our impact on the natural environment by partnering with Princeton residents, businesses, schools, local government and other community groups to achieve measurable results. Facebook fans 704. Twitter followers 2,067. About Blog The Life Habit mission is simple … help people live deeply and deliberately by giving them the tools to follow their curiosities, take ownership of their choices and find the leader within.I'm dedicated to improving your life through building powerful sustainable habits and eliminating those destructive habits that limit your potential. Facebook fans 1,335. Twitter followers 4,284. Chester, England About Blog Habit Health began with the need for quality and clear information on nutrition and habits.Check out the habit and health blog for tips, strategies and methods for nutrition, habit building, personal change and lifestyle.Nutrition habit coaching to change the way you think about getting in shape. Facebook fans 172. Twitter followers 2,408. About Blog To empower others to live happier and healthier lives through powerful habit change. Facebook fans 13,508. Twitter followers n/a. About Blog Increasing Engagement & Building Highly-Effective Teams. One Habit Blog: Build a life that matters to YOU, one habit at a time. Facebook fans n/a. Twitter followers 1,145. Manhattan, NY About Blog The Healthy Habits Doctor provides life changing insights into reversing bad habits through the connection of body, mind and soul. Facebook fans 68. Twitter followers 125. About Blog Simple, practical tips and exercises to help you get organized. I started Organizational Habits to share ideas, tools, and inspiration because I know what a difference being organized has made in my life. About Blog Do it in a smart way. About Blog A filmmaker with over 30 years experience, he has made business films since 1994 through his company Acorn Films. About Blog She is passionate about improving her client’s lives and developing strategies for optimizing your family’s well-being in the hectic modern world. THe has a passion for diet, health, and exercise. About Blog Discover Power Habits for Adding Incredible Success to Your Life. 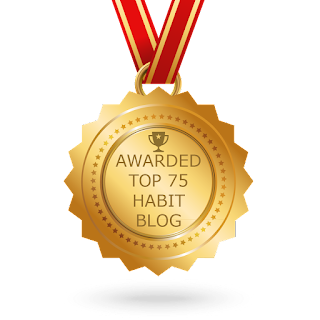 CONGRATULATIONS to every blogger that has made this Top Habit Blogs list! This is the most comprehensive list of best Habit blogs on the internet and I’m honoured to have you as part of this! I personally give you a high-five and want to thank you for your contribution to this world.